Acupuncture is one of the oldest forms of medical treatments known to man. It has been used in treating a wide range of illnesses and conditions for the past 4000 years. The Chinese, Korean, Japanese, and French have all influenced its historical development. “Medical Acupuncture” is a fusion of all these influences, with respect to the more scientific Western knowledge and practice of modern medicine. Acupuncture is a method of encouraging the body’s own life energy Chi, to naturally heal itself and improve its function. Inserting very fine needles into precise points throughout the body, and often applying heat or electrical stimulation, are used to achieve this. Recent Western medical research and trials continue to confirm and support the use of acupuncture in a variety of medical and pain conditions. At Spine Orthopedic Center, a board-certified physician-acupuncturist performs these individualized treatments. The path to becoming a physician-acupuncturist starts with traditional Western medical school education, and subsequent training in the medical specialties. In addition, the physician-acupuncturist completes a rigorous and comprehensive training program that is specific in Medical Acupuncture, and then becomes certified. What conditions or illnesses can be treated with acupuncture? Medical Acupuncture is being continually supported by modern Western medical research. Some patients may feel a slight pinch when the needles are inserted and positioned, while others barely feel anything at all. As the needle is advanced, a dull ache or tingling should be felt at most of the acupuncture points, as an indication of DeChi, or “capturing the energy”. Once the needles are in place, usually no pain is felt. If electrical stimulation is applied to the needles, a light buzzing or thumping sensation is often described as being pleasant. 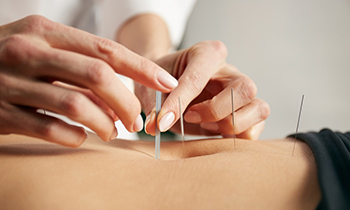 In general, medical acupuncture is one of the safest treatment modalities in all of medicine. All of our acupuncture needles are single-use, sterilized and disposable. On occasion, there may be some slight bruising, which resolves in a short period of time. When will the acupuncture treatments begin to work? For some, the treatment effects are experienced immediately. But for most others, the therapeutic effects take several treatment sessions to notice any effects. It is recommended to initially have at least 4 sessions within about 2 weeks time, to gauge the potential for further benefits with continued acupuncture treatments. Once a positive response is seen, most patients require a “reinforcement” treatment once every month or so.